If you want to arrive at the conference banquet venue (National Maritime Museum) via the Thames River, you can buy a River Roamer ticket and visit many London attractions along the river route from central London to Greenwich Pier. Please have a look at the tourist sites listed below at each pier. Ticket prices may apply for some attractions. Download a Thames River route map here. For Open Top Bus Tours visit www.theoriginaltour.com. 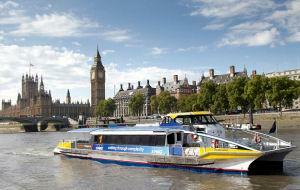 Get free hop on, hop off 1 day bus tours with the London Tour Pass.